1. 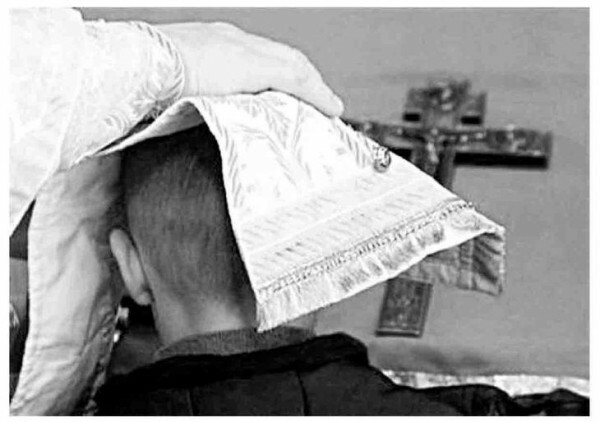 For each conscientious priest confession is without any doubt one of the most difficult and frustrating aspects of his ministry. It is here, on the one hand, that he encounters the only real object of his pastoral care: the human soul, man, as he stands sinful and miserable, before God. But it is here, one the other hand, that he realizes to what degree nominal Christianity has pervaded our Church life. The basic Christian notions of sin and repentance, reconciliation with God and renewal of life, seem to have become irrelevant. If the terms are still used, their meaning is certainly quite different from that, on which our whole Christian faith is based. 2. Another source of difficulties is the theoretical, or even theological, confusion as to the nature of the sacrament of penance. In practice a purely formal and juridical understanding of it, clearly Western and “romanizing” in its origin, coexists paradoxically with an equally doubtful reduction of confession to psychology. In the first case the man comes to the priest, confesses transgressions of Christian law, and receives absolution which entitles him to the second sacrament “of obligation” – Holy Communion. Confession proper is reduced here to a minimum, and in some churches even replaced by a general formula to be read by the penitent. All emphasis is on the priest’s power of absolution and the latter is considered “valid” regardless of the state of soul of the penitent. If the first case reveals “romanizing” tendencies, the second can be termed “protestantizing”. Confession is regarded as “counseling,” as helping and solving difficulties and problems and is a dialogue not between man and God, but between man and a supposedly wise and experienced advisor with ready answers to all human problems. Both tendencies, however, obscure and deform the truly Orthodox understanding and practice of confession. 3. The existing situation is due to many factors. And, although, it is obviously impossible to enumerate all of them here and to even outline the very complicated historical development of the sacrament of penance, a few remarks are necessary before we discuss possible solutions. a) Originally the sacrament of penance was understood and practiced as reconciliation of those excommunicated, i.e., banished from the “ecclisia” – the assembly of the People of God and its fulfillment in the Eucharist which is the “Koinonia” of the Body and Blood of Christ. The excommunicated is the one who cannot offer and, therefore, cannot receive. This reconciliation was a long process and the absolution – its final seal, the sign or “image” of repentance, i.e., of the rejection and condemnation by the penitent of his sin and alienation from God, of its real confession (manifestation, recognition) as sin. The power of absolution was not thought of as a “power in itself,” virtually independent from repentance. It was indeed the sacramental sign of an accepted repentance which has brought forth its fruit. The Church in the person of the Priest witnessing that there is true repentance and that God has accepted it, has “reconciled and united” the penitent with the Church. 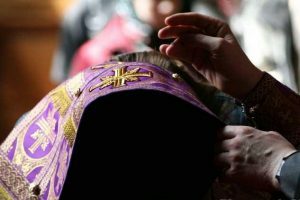 Whatever changes occurred in the practice of the sacrament, this first and essential meaning, is still the starting point of its Orthodox understanding. b) Also from the very beginning the ministry of the Church implied the care of souls, i.e., guidance in spiritual life, help in a man’s fight with the old Adam in him. But at first, it was not included in the sacrament of penance. It was under the influence of monasticism with its highly developed theory and practice of spiritual guidance, that the latter became little by little an integral part of confession. Yet, in monasticism itself this spiritual guidance remained for a long time distinct from sacramental confession and was entrusted quite often to non-ordained monks. What made it an essential aspect of the pastoral ministry and almost the central contents of confession was the progressive secularization of Christian society. The Church after Constantine ceased to be a minority of heroically minded “faithful,” she identified herself almost completely with the “world” (cf. the Russian term “mirianin” for “laikos”) and had to deal with a multitude of nominal Christians in need of help, constant guidance and personal care. The significant change in the Eucharistic practice (from a corporate communion as an essential act of membership in the Body of Christ – to a more or less frequent individual communion) which occurred during the same period and under the influence of the same factors, meant a decisive transformation in the understanding of penance. From a sacrament for those cut from the Church, it became a sacrament for those inside the Church. The theological emphasis shifted from repentance to absolution, as virtually the only essential element of the sacrament. c) The secularization of Christian society made it open and receptive to humanistic and pragmatic philosophies of life, which radically obscured the Christian idea of sin and repentance. The concept of sin as separation from God, from the only true life in Him and with Him, was progressively replaced by a sort of moral or ritual legalism in which sin means primarily the transgression of an established rule. In a man centered and self-satisfied society with its ethics of success and purely external “decency,” these rules themselves underwent a radical transformation. They ceased to be regarded as absolute norms, and were reduced to a socially accepted ethical code. If an early Christian always knew that he was a sinner whose sins are forgiven and who, without any merit on his part, is introduced into the Bridal Chamber, given a new life, made partaker of the Kingdom, the modern Christian, since in the eyes of the society he is a decent man and a “nice fellow” always “feels fine” about himself and thoroughly enjoys his self admiration. His vision of life, which, in turn, shapes his understanding of religion, excludes altogether any dimension of depth, be it that of his alienation from true life (sin) or that of a new life in Christ. From time to time he commits, to be sure, certain transgressions – very common and minor! – but, after all, who doesn’t? However, when I recently happened to confess about 50 people in a typical Orthodox parish in Pennsylvania, not one admitted to have committed any sin whatsoever! Are we not told daily by the press and other media of mass communication that we live in the best possible society among the best possible people? “Christian” people have taken this affirmation quite seriously. d) This secularism finally won the hierarchy and the priests themselves. Our Church life is simply based on a system of mutual praise and adulation. A parish is always happy about itself and requires the pastor to constantly thank his “fine” people for their contributions, efforts, help and generosity, to be the mirror in which they can admire themselves. The same spirit of success, “good-neighborhood,” and external activities pervades our life from the top to the bottom. The success of the Church is measured in terms ofattendance, financial wealth and the number of “parish affairs” of all possible kinds. Where in all this is there any room for repentance? It is indeed absent from the very texture of the Church’s preaching and action. A priest can call his parishioners to ever “bigger ‘n better” achievements of material nature, he can sometimes voice his dissatisfaction with their “attendance” and “obligations,” he can fight masonry and church committee, but he himself usually does not think in terms of a world which “. . . is the lust of the flesh, and the lust of eyes and the pride of life” (I John 2:16). He himself does not really believe in the Church as salvation from the despair and darkness of sin, and not an institution for the satisfaction of the “religious needs” of members “in good standing.” In these spiritual conditions, in this pseudo-Christian moral situation confession cannot be but what it actually is: either another “religious duty” to be performed once a year for the satisfaction of an abstract canonical norm, a real “end in itself” with no spiritual consequences whatsoever, or, then, a discussion of one’s “problems” (not sin, for a sin, as soon as it is recognized as such, has ceased to be a “problem”) which most of the time have no solution precisely because their only solution would be the conversion to real Christianity. 3. Can a truly Orthodox view and practice of confession be restored? Yes, if we have the courage to deal with the problem at its roots and not with mere externals. The starting point of this restoration is in preaching and teaching. To some extent all Christian preaching and teaching is a call to repentance, to the metanoia, the change of mind, the reevaluation of all values in the light of Christ. There is no need to preach constantly on “sin,” to judge and to condemn. It is when a man is challenged with the real “contents” of the Gospel, with its Divine depth and wisdom, beauty and all embracing meaning, that he becomes “capable of repentance,” for the true repentance is precisely the discovery by the man of the abyss that separates him from God and from His real offer to man. It is when the man sees the bridal chamber adorned that he realizes that he has no garment for entering it. Too much of our preaching is in the form of abstract imperatives: the Church prescribes to do this and that; but commanding is not preaching. Preaching implies the desire to convey to people the positive, the Divine meaning, for it is only this meaning that makes “prescriptions” significant, life-giving, saving. Christian teaching should also include a deep and constructive criticism of the secularistic philosophy of life, an evaluation of the culture in which we live. Christians must always fight idols – and there are plenty of them today: “success,” “materialism,” “security,” “money-centerdness,” etc. For here again, only within such broad and truly Christian judgment of this world the notion of sin recovers its true meaning, as deviation of love and interest, as worshipping values and norms that are not truly “valuable.” This implies, of course, that the priest himself is free of this identification with the world, puts eternal Truth and not the “practical considerations,” in the very center of his ministry. Both preaching and teaching must have a prophetic element in them, i.e., an element of Divine judgement, an invitation to consider everything in this world with the eyes of Christ. 5. Confession, then, must be replaced in the perspective of the sacrament of penance. And each sacrament implies at least three equally essential elements: preparation, liturgical order, and fulfillment. If the whole life of the Church, but especially preaching and teaching are, as we have seen, preparation for repentance in a broad sense, there is room and need for spe cial preparation. The Church has set apart special periods of repentance: Lent, Advent, other fasts. Here the liturgy itself becomes a “school of repentance” (cf. 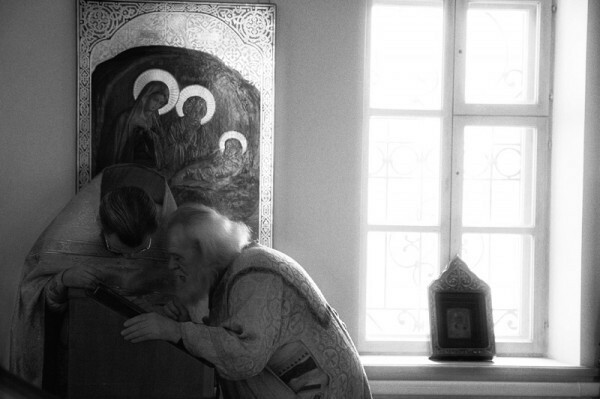 for example the inexhaustible riches of the Lenten Triodion), and it is the proper time to center preaching on the sacrament of penance itself. The order of Gospel readings, the Psalter, the hymns and prayers supply us with abundant material, the purpose of preaching being to “apply” all this to men, to their life, to their actual situation. The goal is to provoke in them the penitential mood, to make them examine their life not only in terms of isolated sins and transgressions, but in their deepest motivations. Where is the real treasure of their hearts? What guides them in their life? How do they “feel” the precious time given them by God? What is the meaning of this rapid progression to the unescapable end? A man who questions the deep motivations of his life, who has understood, be it just once, that life in its totality can and must be referred to Christ, is on his way to repentance, which is always a conversion, a change of mind, a renewed vision, a decision to return to God (cf. my pamphlet on Great Lent). The preparation must, of necessity, include an explanation of confession, – its order, prayers, meaning. Prayers before confession should never be omitted. Confession transcends the level of a human dialogue and also that of a purely rational acknowledgment of guilt. The man can say – “guilty” and yet feel no repentance. All sacraments are acts of transformation. And the first transformation in the sacrament of penance is precisely that of a human confession of transgressions into Christian repentance, i.e., into a purifying crisis of the human soul, which turns itself to God and from Him receives the vision of both – sin and the overwhelming love of God “covering” that sin. But this transformation requires Divine help and prayers before confession invoke and call for, this help. They are, therefore, an integral part of the sacrament. But it is essential that at this solemn moment, when the priest points to the presence of Christ, he himself would not be opposed to the penitents. One of the best forms of exhortation is an identification of the priest with all sinful men. “We have all sinned . . .” For he is neither a prosecutor, nor a silent witness. He is the image of Christ, the One who takes upon Himself the sins of the world, and it is his active charity which will move men to repentance. 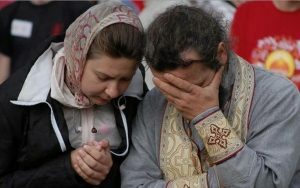 The Russian pastorologist, Metropolitan Antony, defined the essence of priesthood as “compassionate love.” Penance is the sacrament of reconciliation, i.e., sacrament of love, not of judgment. A) Relation to God: – Questions on faith itself, on possible doubts or deviations, on prayer, liturgical life, fasting etc. Too many priests narrow the whole confession to “immoral acts,” forgetting that the deep root of all sins is in the weak or deformed faith, in the lack of love for God. B) Relation to fellow man: – The basic attitudes of selfishness and self-centerdness, indifference to men, lack of attention, interest, love. All acts of actual offense must be mentioned and their sinfulness shown to the penitent. Envy, gossip, cruelty, etc. C) Relations to one’s self: – Sins of flesh with, as its counterpart, the Christian vision of purity and “wholesome,” respect for the body as an icon of Christ, etc. – Lack of serious interest, of any real effort to deepen the whole life; alcohol, cheap idea of “fun,” irresponsibility, family relations. We must never forget that we usually deal with a man who is not used to examine himself, whose attitudes towards life are shaped by common standards, who is basically self-satisfied. It is the function of the confessor to shake this “petty bourgeois” attitude, to show the penitent the real Christian dimensions of perfection, to challenge him with the idea of constant conflict. The Christian vision of life is a tragical one and unless people realize it, there is simply no hope for a “Christianization” of our soft and socially centered Church life. And then, only then, comes the absolution – as the fulfillment of all this: – preparation and effort, preaching and meditation, exhortation and confession. Once more, from an Orthodox point of view, there can be no absolution where there is no repentance. God does not accept a man, who has not come, and “coming” is precisely repentance, an act of “conversion,” a real and critical change of the whole attitude of man. To think of absolution as sheer “power,” valid and efficient whenever pronounced by the priest, is to deviate from Orthodoxy into a magical sacramentalism and a “juridicism,” denounced by the whole spirit and the entire tradition of the Orthodox Church. – conceals his sins or fails to acknowledge them as sins.